Facebook wants to put an end to typing billing details on the small screen, help developers and payment processors earn more money, and prove that its app install ads make money for e-commerce companies. So today it’s rolling out last month’s test of “Autofill With Facebook” in partnership with PayPal, Stripe, and Braintree to two e-commerce apps, JackThreads and Mosaic, with more to come. It’s important to understand this feature is a partnership with payment providers and is additive, not necessarily competitive, at least for now. One day Facebook could try to conquer more of the payments flow by processing payments itself. But currently, if a developer uses Braintree, Autofill With Facebook layers on top of it, and Braintree still earns its processing fee. These three partners could become two shortly, as we’ve reported that PayPal may be close to buying Braintree. The “early test” feature as Facebook calls it will appear in the Mosaic (photo book-buying) and JackThreads (hip clothing) iOS apps for some users starting today, and for those who have payment info stored on Facebook by the end the week. 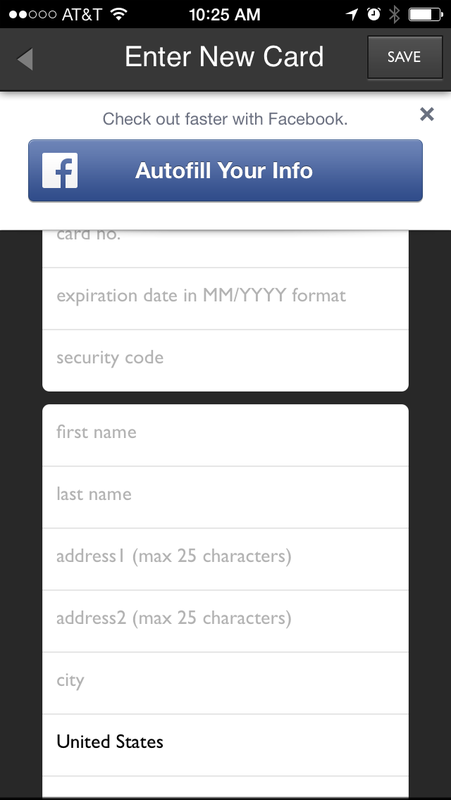 You can add your payment info to Facebook by hand here. Previously this test was only available in early beta to a small percentage of JackThreads users. Developers can sign up for access later, but won’t be able to use the feature until they get approval. Update: Facebook tells me that while PayPal has committed to joining the test and supporting Autofill With Facebook, it hasn’t actually built out its integration yet. JackThreads and Mosaic both run on Braintree, and Stripe has built its integration for some apps that will launch the feature soon. Here’s how the feature works for users. E-commerce app shoppers browse items and add them to their carts like they normally do. Then something different happens if they’ve previously stored billing info with Facebook when they bought a Facebook Gift, Credits or in-game purchase on desktop. When these people go to checkout and are asked to fill in their billing info, such as credit-card number, billing address, and shipping address, a “Check Out Faster With Facebook” message and blue “Autofill Your Info” button slides down from the top of the screen. When tapped, users are shuttled into their Facebook for iOS app where they can look over their payment details and select a shipping address. They click “OK” and on the backend, Facebook and the app developer’s payment processor do a “handshake” so the credit card and other info is securely transferred. On the front end, the user only sees the last four digits of their credit card number for security. The user is then whisked back to the commerce app where they see their payment info pre-populated in the fields. They can then confirm their purchase without ever having had to type anything. Some people are sure to think Facebook passing your credit card info around is creepy, but in fact the social network has a relatively solid track record for data security. It’s had a few hiccups and bugs, but no wide-scale hacks of user passwords like Twitter and LinkedIn have. If you’re concerned with Facebook taking over the world, though, this test could certainly be a pre-cursor to it knowing more about what you buy. Then again, if you own Facebook stock, maybe that’s a good thing. For users, this makes converting on mobile much quicker and simpler. That means they’re more likely to go through with a purchase before they get distracted or second-guess themselves. E-commerce app developers earn more money thanks to more conversions. As for payment processors, they get to handle more payment volume and earn more fees. For Facebook, this is part of “Build – Grow – Monetize” platform strategy. When you make an auto-filled purchase, Facebook knows who you are, how much you spent, and in what app. That’s critical to it proving the return on investment of its app install ads. If JackThreads hits you with a $1 Facebook ad to download its app, and Facebook sees that you clicked and five minutes later spent $25 at JackThreads, it can convince the e-commerce app developer it’s a good use of spend and they should buy more campaigns. As Appbistro co-founder Nalin Mittal notes, working with payment processors could be a stopgap solution for Facebook. Right now, it doesn’t have that large of a catalogue of credit card numbers, especially compared to Amazon, Apple, or PayPal. It’s working on that, though, by pushing its Gifts ecommerce store and in-game payments. Eventually if Facebook was able to collect enough credit card numbers that it could support Autofill With Facebook for decent chunk of users, it might replace payment processors like PayPal, Stripe, and Braintree with its own payment processing system. Facebook is already equipping developers with tools to host the backend of their apps with its acquisition Parse, and add social login and sharing features via its SDKs. Handling payment processing for them on the backend the way Stripe does could be a convenient service to offer. That might mean buying its way into payment processing rather than building out the technology, sales team, and fraud protection itself.